NASA has a new planet-hunting space telescope that is now operational. TESS (Transiting Exoplanet Survey Satellite) is designed to scan the night sky for alien worlds that are not too far from us. The telescope started gathering data on Wednesday July 25th, 2018. TESS will start sending its data back to Earth in August and new data will be sent every 13.5 days. "I'm thrilled that our planet hunter is ready to start combing the backyard of our solar system for new worlds," said Paul Hertz, the director of NASA's Astrophysics division. He further said, "With possibly more planets than stars in our universe, I look forward to the strange, fantastic worlds we're bound to discover." TESS was launched on April 18th, 2018 in orbit around Earth. Over the last several months the scientific team has been testing the instrumentation and making sure the telescope was ready for use. TESS sent its first test photograph in May. The image was of 200,000 stars, many of which are thought to have one or more planets in orbit. 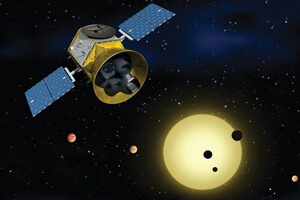 TESS is NASA’s third planet-hunting telescope. Kepler was the second and over the course of its mission it identified 2,650 exoplanets. Like Kepler, TESS will utilize the transit method, which measures a star’s dip in brightness as a planet passes in front of it. TESS will focus on the 200,000 brightest stars in the sky, so if new exoplanets are identified, they will be around stars amateur astronomers already know and love. The TESS scientific team is estimating they will discover around 1,600 new exoplanets. Some should be the size of Earth. TESS has a planned mission lifespan of 2 years. Exoplanets that TESS identifies will very likely become targets of further scientific research. NASA’s greatly delayed James Webb Space Telescope will be able to study far away exoplanet atmospheres. The James Webb Space Telescope will be able to study known exoplanets in far greater detail than any current or past space-based telescope.